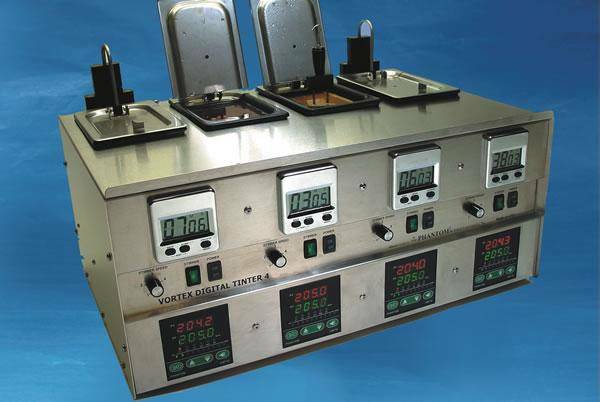 Vortex Digital Tinter 4 is an advanced generation four vat (tank) tinting system combining four accurate digital “auto-tuning” PID temperature controllers with bright LED displays showing the desired (set) and actual (measured) temperatures of each tank. Each tank has an individual digital process timer to monitor tinting times. 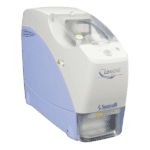 Vortex 4 incorporates variable speed stirring, hinged-lids that do not need to be removed when tinting lenses, and special coated easy to clean stainless steel vats for heating lab chemicals. The temperature probe located in each tank precisely measures the solution temperature (not HTF temperature), preventing messy boil-overs. The detachable probe allows for easy vat removal and cleaning. Vortex 4 is simple to use and is the perfect machine for fast absorption of tints and UV into coated polycarbonate, hi- index, and CR39 lens materials. Digital temperature control, with detachable temperature probes. Nonstick tanks for easy cleaning.